A few miles Northeast of Decatur is a small, newly formed city that you may have never heard of. The neighborhoods weave through the city like a tangled maze, easy to get lost in and forget how close you are to downtown. A walk down Main Street feels like another place and time altogether. Neighbors who’ve been there for decades enjoying festivals and new restaurants with the wave of thirty something's who have recently found this blossoming city sitting on the edge of the perimeter. Immediately there is a sense of something happening here that you’ve been looking for all along. A sense of excitement and growth combined with a community who cares about each other and has a pride in where they live. This place is Tucker! In the past two years, Tucker has experienced a lot of exciting growth and development. Although the town was founded in the 1892, it was recently incorporated as Dekalb County's newest city in 2016. The city held its first election in March 2016, electing its first city council members and Mayor! 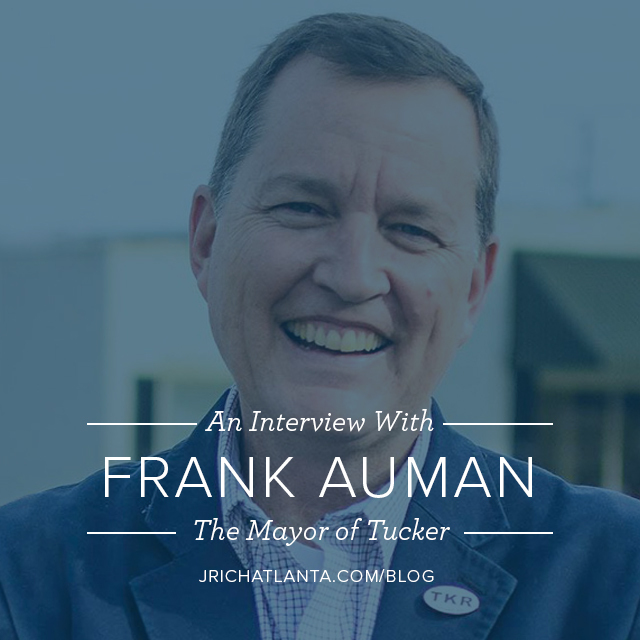 A few weeks ago Dave Sanders, J.Rich ATL lead agent of Tucker, had the honor of interviewing Tucker's first Mayor, Frank Auman! In this interview, Dave asks Frank Auman about his family, background, how Tucker became a city, what makes Tucker unique, and what is in store as the city continues to grow! We hope you enjoy this interview and get excited as we are about what is next for the city of Tucker! How did Tucker become a city? Tucker was established as a City just a couple of years ago. This was the result of local citizens speaking up when they did not agree with the direction and how the boundary lines were being drawn. [I] Got involved with a group of active citizens and wanted to determine what to do in terms of what was best for Tucker. The conclusion was that the best move forward was to advocate establishing Tucker as a City. This result would not happen without a lot of work. From there [I] took multiple trips a week to the capital to fight on behalf of Tucker becoming a city. A month before the referendum passed, we started to realize we needed to put people in a position to guide the city. It was time to start thinking through who would be willing to help lead the City and become Mayor. Turns out, that person ended up being me! What's next for you as mayor now that you have been elected for a 4 year term? In the beginning, it was a 100 miles an hour every day because of the hectic nature of becoming a city. So I’m looking forward to settling in and being able to bring to fruition some of the things we’ve been working so hard on. The first term was shorter because it was a special election; typically they are every odd-numbered year. That is why I served a two-year term prior to this 4-year term election. Two years from the end of 90 days, we were required to have everything they put in the charter into place. This was everything from parks, to code enforcement, zoning, planning etc. So i'm looking forward to my first full term after working so hard to get those things into place. Nobody cares more about what happens right here in the city, than those who live in the city. Tucker is being discovered as a place to "live, work, play and pray". Tucker is that kind of place and is intentional about being that kind of place. What do you see happening in downtown Tucker? We don't want to be anybody else. We want to be us. It is going to become organically mixed use. We want to keep the stuff we love and nurture those things and improve the stuff that can be better. A walkable community with businesses of all sorts, entertainment with green space, restaurants, open up sidewalks up and down 1st avenue and other side streets. Develop space to have several sections that branch off of the main street. Places to live and new restaurants that branch off of the main drag. It's coming! You just can't force it or engineer the timing. I am most excited about the opportunity to be a part of the decision making that goes into the zoning and development that will help mold the direction of the City. City council reps 11k people and there are two representatives in those districts. If you want to be heard, the access is there for your voice to be heard. Universal high-speed Internet, fiber, citywide in every public space. It is important to attract business and make it easier to conduct business. Also, setting up the infrastructure to have a smart city and autonomous vehicles. The small city has the ability to decide if that's an investment worth making. What makes Tucker so great? Tucker has a community that other people don't. Most areas have an average about 15% volunteer rate, in contrast, Tucker has more like 75% of its citizens that are willing to volunteer. Volunteers have launched several initiatives and businesses like the livable centers initiative, rotary clubs, optimist clubs, the business association, civic associations, all friends of the parks organization and more. It was organic and it just happened due to the hard work of our citizens and volunteers. We stand on the shoulders of these people. So while we're starting new, the foundation is anything but new. And that's community. The theme of the comprehensive plan and Tucker being a connected community is wanting to nurture that community and let it be woven into the fabric. People yearn for a sense of community and they don't realize it sometimes until they've found it. People that have been here a year or two say they have never seen anything like it and they love the way the neighborhood knows and looks out for each other. We want them to find something here where they get the feeling that they don't ever want to leave it. Frank Auman is originally from Tampa, Florida. His dad was a civilian with the Department of Army, which moved his family to DC, then to Hawaii, and then to Atlanta when Frank was in the 6th grade. He graduated from South West Dekalb and went on to graduate from the University of Georgia. While at Georgia he met and eventually married his wife, Gaye, who is a native to Tucker. Auman maintains a lapel pin business that he has operated for the last ten years. His collection of stories and pins alike is something that draws you in right away. He has rare pins from all over the world, most of which coincide with the Olympics that he’s traveled to. Frank and Gaye Auman have been married for 29 years and have three daughters and two son in laws. All of their children have attended the University of Georgia; the last one, Grace, will start this fall. Gay’s family line are all native to Atlanta, making their daughters 8th generation natives! My family lives in a loft in a small, seven-unit warehouse in Inman Park. Most of our neighbors are businesses and we live in what was previously an office space. 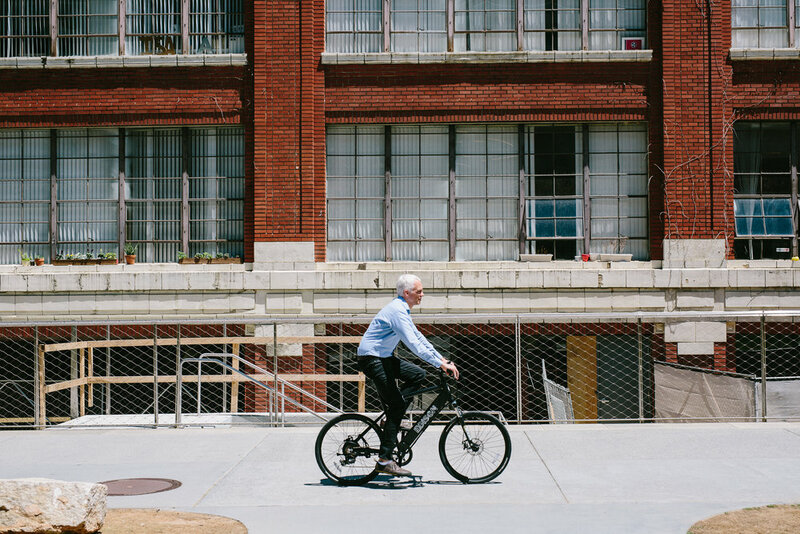 Otherwise, it’s ideal – in a great school district, surrounded by shops, restaurants, and city life, and I can ride my bike (6-minutes) or walk (20-minutes) to my office at Industrious, a co-working space inside Ponce City Market. That commute is a direct, car-free route along the Atlanta Beltline – a transformative urban infrastructure that is changing the way people live in the city. The project began as my graduate thesis at Georgia Tech back in 1999 and today it’s our route to the park, the grocery, or to meet friends for dinner. We are truly living a dream. Our loft, however, was hard to come by. When we moved to this part of town, we couldn’t afford a single-family house and we weren’t sure we wanted one anyway. Our previous home was amazing, but its upkeep was expensive and took a lot of time out of our already-busy lives. We were ready for something else and open to unconventional ideas. Even so, when we looked at multi-family buildings or non-residential alternatives in the neighborhood, our options were seriously limited. Almost all the new, larger developments were designed for single people, roommates, and couples – it would be hard to make them work for a family. We found a smattering of small, older apartment buildings that are better designed for families, but the units got snatched up very quickly. And the new slew of townhouses being built in the area were mostly too expensive – in fact, we couldn’t afford our loft if we were trying to buy it today. The need for this kind of housing is an enormous and largely untapped opportunity for both communities and builders. It’s called “missing middle” housing – the middle ground between single family houses and multi-story apartments that has been largely missing from American homebuilding for generations – certainly in places like Atlanta. It takes many forms, including traditional townhouses, row-houses, or brownstones, as well as small apartment buildings and individual garage apartments – what city planners call “accessory dwelling units,” or ADU’s. The missing middle also includes less-traditional alternatives. Lofts like ours are carved out of old industrial or commercial buildings but these too often do not include bedroom doors, storage, or other features required by most families. “Micro-unit” apartments and “tiny houses” trade square footage for location. “Co-housing” developments cluster individual units around shared recreational spaces or gardens and encourage residents to share meals, tools, and services like laundry or housekeeping. “Shared housing” goes even further with shared rooms, kitchens, formal agreements for housework or homecare, and sometimes even hotel-like features and services. Whether traditional or new, these forms of middle housing are good for communities for two reasons. The first is that they cultivate diversity, an essential characteristic for the economic and cultural resiliency of urban neighborhoods – not to mention it makes them more interesting. We all benefit when we live with and among people of different ages, incomes, races, ethnicities, religious or cultural affiliations, economic or educational status, sexual orientations, gender identities, or political persuasions; people who work different types of jobs at different times of day; people with varied interests like hunting or quilting; night-owls and early birds; homebodies and jet-setters; wallflowers and showboats; and people with different attitudes, philosophies, or outlooks on life. Real diversity like this is supported by a diverse stock of housing options. The second reason middle housing is good for us is that it increases density. Relatively low-density areas like Atlanta’s cherished intown neighborhoods need more people to support transit, retail, healthcare, and other services within walking distance. In this way, neighborhood-scaled middle density is part of a strategic approach to managing the growth and regional traffic that seems to consume another neighborhood every day. If we don’t have to travel so far for every trip, we have a chance of maintaining a high quality of life in the face of increasing and seemingly-inevitable regional congestion. In cities, density and diversity work together to support community vitality through more and better shopping, recreational, and cultural amenities. They strengthen investments in transit and other forms of mobility and improve public safety by providing more “eyes on the street” at all times of day or night. Middle housing allows us to support aging parents, young students or newlyweds, immigrants, artists, mechanics, service workers, and others who contribute to both our economy and lifestyle. We all need to live in these communities if we want them to function and thrive. For those of us who want more middle housing, there are several things we can do. We can become YIMBYs (Yes-In-My-Back-Yard) for any reasonable effort that supports diversity and density in our neighborhoods. This can be related to specific development proposals near our homes, or to general policies that expand housing options – ADUs, for example, (they are currently illegal), reduced requirements for home or lot size, and other needed updates to our zoning codes. We can advocate for the elimination of parking requirements as a strategy to discourage driving, decrease housing construction costs, and increase the number of units possible on any given parcel of land. We can also support related efforts to expand affordable housing, knowing that both investments and regulation are required to achieve density that is truly diverse. This work is urgent. Whether we want change or not, our region is set to grow by 2.5 million people over the next twenty years, and in that time, central Atlanta will at least double its current population. That kind of growth represents incredible opportunity and there’s no excuse to not include everyone. In fact, an inclusive approach to growth will make our region even more prosperous. To achieve that best outcome, however, there are many things we must do – employment, education, mobility, opportunity, affordability – and more middle housing should be an essential part of our strategy. 1. What is the most important next step for Atlanta in order to start producing missing middle housing options? We need to loosen regulations and allow ADUs and other small housing projects (2-10 units) in neighborhoods, and we should eliminate their parking requirements. Let’s let the market determine if people prefer off-street parking or better/larger/cheaper homes. The world is changing, and so is Atlanta – let’s give people an incentive to ditch their car. 2. If I have a friend or neighbor who is against density because to them it means more traffic and street parking. How do I start the conversation to explain why density is actually a really good thing? It’s important for people to understand that with the regional growth that is coming whether we like it or not, traffic in central Atlanta is not going to get better and our streets will be full of parked cars. With that as a given, our best strategy is to make sure our communities are still great places to live, and that means sufficient density to support local economic ecosystems so that we don’t have to travel so far, and so we don’t have to drive to get there. 3. I've heard you talk about Atlanta and its place in history. What is Atlanta's opportunity to lead out in the missing middle housing? Embracing change is in Atlanta’s DNA, and we have a history of stepping up to a challenge. If we look at the affordability crisis in cities like New York and San Francisco, we can see that that’s where we’re heading. If we embrace that change, however, and act quickly to do something about it, we can leverage change to actually improve our quality of life. Middle housing is central to any such strategy because it lets the private market lead the way – another Atlanta legacy. 4. Lastly, what Atlanta development or project are you excited about? The Atlanta Beltline, of course – and it’s important to name it and remind ourselves that it’s not finished. We’ve got a long way to go and I’m still excited about the opportunity to get it right. We’re not too late, but especially on the issues of housing and transit – we need to act quickly! A hotplate, 2 electric skillets, a home-use 12-cup Mr. Coffee pot and a Foreman grill were all part of the humble beginnings of Le Petit Marche, a neighborhood market turned Atlanta destination. On the eve of its 9th anniversary, the little market remembers the not-so-distant past of nearly going out of business and shyly welcomes the stream of recognition and accolades. Owner, Marchet Sparks, a Los Angeles transplant, recalls the day when her bank account was a shocking $181. "At this point, I literally lost everything and had to move from home-ownership to renting a room from a friend for nearly 3 years. I settled into a long partnership of depression and alcoholism all while suiting up and showing up for work everyday." After many crucial sacrifices and adjustments, Sparks shifted her focus from mostly retail pantry fare to what was keeping the lights on: her small kitchenette serving tasty lunch sandwiches. Even while struggling, she held to her dream that the market had great potential and with strong community support and the addition of breakfast, the concept began to stick. "I have an affinity towards Kirkwood and nearby areas for standing by me in the early years. They believed in me and saw the enormous efforts being made by a close-knit family determined to survive." Sparks is not only surviving but thriving with 2 expansions under her belt and a Westside franchise on the way. "It amazes me to this day how far I've come. Now, nearly 4-years sober, I am proof that adaptability, belief in oneself, support from family and friends, patience and a little faith can turn things around." With Mom's homemade soups / baked goods and with Pop greeting customers with a sweet genuine smile, a dining experience at Le Petit Marche is like snuggling up with your favorite blanket. It's familiar, it's cozy, it's home. 1. Can you tell us a little bit more about your relationship with your amazing parents? Did you get inspiration to open Marche from your Mom's homemade recipes? My parents are my main source of inspiration. Happily married for nearly 50 years, they taught me how to stay the course, to be flexible. Since my earthly beginning, they have always been supportive of my endeavors no matter how wild or crazy! They taught me the art of compromise and above all else, to keep the faith. My grandmother was completely illiterate and could not read or write but she carved out a living as a cook and passed that knowledge down to my mom an ultimately to me. I credit these wonderful people for shaping my life; a direct reflection of Le Petit Marche. 2. What is your one piece of advice to someone who is a small business owner or aspires to open a small business? The best advice I can give to someone starting a small business is to be willing to learn and not assume to know everything. Be discerning all while letting others help you. Be open to advice. Pay attention to what works and build on that! It may take you in a different direction than you anticipated but the ultimate goal is to have a successful business and to have a balanced, happy life, right?!? 3. Lastly, do you have any more information on the westside franchise? Potential location and opening date? A Westside franchise is in the making off Northside drive near the new stadium. We are hoping to be open in a year. Stay tuned!